The Shared Universe : Page 23 of 24 : The Internet's Bay Bridge connecting the Bay Area's comic fandom. Ignatz and Harvey Award winner Jim Woodring will be joining Bill Frissell’s Beautiful Dreamers jazz trio onstage at the SFJazz Center on September 14. Woodring, who is best known for his surrealist comic book Frank, will be creating illustrations live while the trio perform music from their self-titled debut. In 2006, Woodring and Frissell collaborated on Probability Cloud which resulted in the duo being among the first to be honored as United States Artist Fellows. Woodring and Frissell will be taking part in two performances on September 14. The first is a Family Matinee at 2 p.m. which is intended to provide an all-ages accessible window into the world of jazz for an affordable ticket price. The full performance with Frissell’s Beautiful Dreamers and Woodring will be at 7:30 p.m.
More information on the Family Matinee can be found here. More information on the Beautiful Dreamers performance with Woodring can be found here. 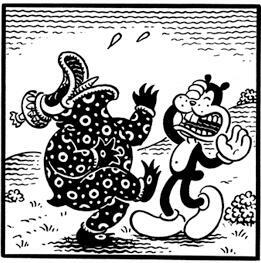 Image from Jim Woodring’s Congress of the Animals. One of the most-buzzed about announcements the week of the San Diego Comic-Con was Madefire’s partnerships with 3rd party publishers and bringing the Motion Book treatment to their top properties. That day has come for the award winning and top 4 comics publisher IDW as they bring a trio of their most-popular titles-My Little Pony, Star Trek, and Transformers-to Madefire’s groundbreaking experience on August 28th. Madefire spent the last year perfecting the Motion Book with their own acclaimed content on iOS mobile devices and the web. Their web-reading partner is social network and creative powerhouse deviantART.com, and the Madefire app has been 5-star rated since launch, even landing on the App Store’s “Best of 2012” list. With more content debuting as Motion Books in the coming months there’s no better time to familiarize yourself with the new grammar of the future of storytelling! The Berkeley-based company announced the app in June of 2012 with a new comic created by Dave Gibbons. The new title, Treatment, is written specifically to take advantage of the unique style of sequential storytelling made possible by Madefire. The motion comics are also available through a partnership between Madefire and deviantART. By partnering with deviantART the company gains access to a large community of illustrators who may be interested in applying the motion comics publishing platform to their own work. IDW will soon be joined on Madefire by BOOM! 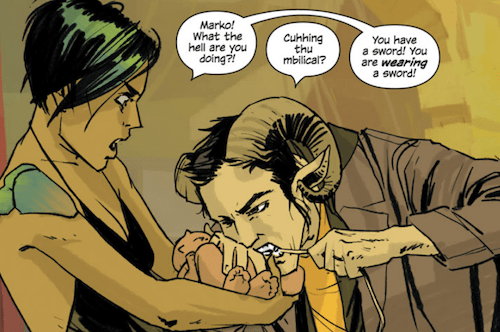 and Top Cow. Comics delight me to my core and cooking soothes my soul. 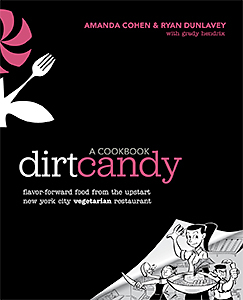 So I loved Dirt Candy, a graphic novel that serves as both accessible cookbook and charming memoir, before I even owned it. Dirt Candy made a zealot out of me. Not only was I on a mission to make my vegetables more interesting, I was a comics/cookery proselytizer. “The market is ripe for practical non-fiction in my comic shop!” I cried far and wide. “Let there be graphic novels for cocktails next! Try this spring pea flan I made!” Dirt Candy occupies such a tremendously unique niche that I fervently hope similar works follow. Batwoman proposal from issue 17. No one except those who were in the editorial board room knows if this decision was based on a company policy against DC’s LGBT characters getting hitched. 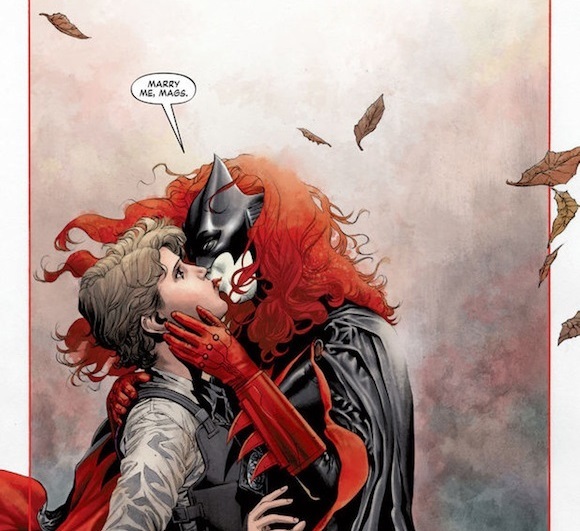 It would seem odd in light of the company’s increasing comfort with prominent LGBT characters including Batwoman, Midnighter, Apollo, Sarah Rainmaker, Alysia Yeoh, and Alan Scott. What we do know is that DC erased every major character marriage — most notably the marriage between Superman and Lois Lane — when they relaunched the DC Universe in 2011. That suggests DC may have a policy to limit the marriage of title characters — no matter their sexual orientation. DC has never declared that limiting marriages is a policy. No matter the justification for denying the marriage, the departure of Blackman and Williams once again brings negative attention to DC’s editorial department, who seem to have an increasing problem of not trusting some creators while putting too much faith in others. When 2013 comes to a close there’s little doubt Jonathan Hickman and Nick Dragotta’s East of West will be on many “best of” lists. 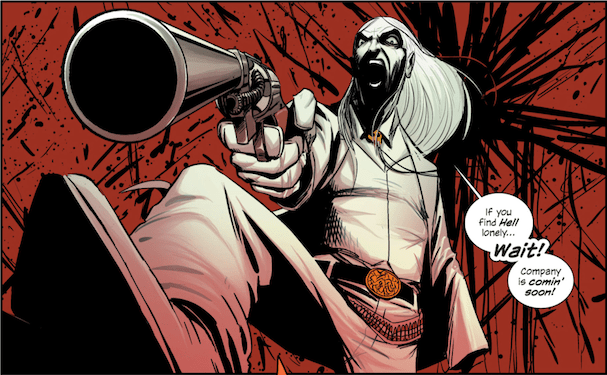 There have been many versions of the age old Four Horsemen of the Apocalypse story, but what’s unfolding in East of West is unlike any that have come before. In only the first handful of issues Hickman and Dragotta laid the groundwork for a future Earth that’s rich with storytelling possibilities. 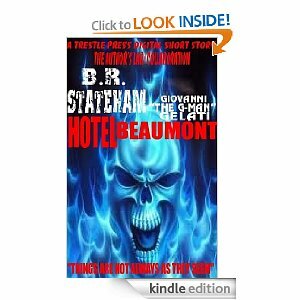 The title smashes genre barriers and becomes at once original and familiar. While at the core is a sci-fi western, a reader may taste a bit of Alphaville on one page, but three pages later the flavor of Lady Snowblood. Our favorite new series of 2013 is definitely the post-apocalyptic western EAST OF WEST and we couldn’t be more excited to get to celebrate the launch of the collection with the book’s amazing artist… Nick Dragotta! Nick’s art has dazzled us for a few years now with mystic arts and high mutant weirdness on X-STATIX PRESENTS: DEAD GIRL (with Isotope favorite Peter Milligan), explored the uncomfortable underbelly of the Marvel Universe on VENGEANCE (with another IsoFave Joe Casey), dazzled our poor little minds on FF (with yet another favorite ’round these parts Jonathan Hickman), transported us back to yesteryear on CAPTAIN AMERICA: FOREVER ALLIES (with comics legend Roger Stern), and always always brings a smile to our faces with his awesome site HOWTOONS. Come celebrate with us! Our beloved Kirsten Baldock is crafting up a palette-stunning cocktail list based on Nick’s work in honor of the evening. Mister Dragotta promises a sketchbook-filling Four Horsemen styled evening… and we’re hoping he’ll bring in some original art for us to buy as well! Are you ready for the Post-Apocalypse Now? We are! So there’s this book. It’s about a scary filmmaker and his scary films. This premise is not without promise. But what earned it a spot on Gawker is its accompanying smartphone app that offers up additional material when you scan certain pages. Furthermore, the book itself incorporates images throughout. 1. The extras are poorly executed (bad acting seems to be a factor). 2. Books are sacrosanct texts unsullied by graphic components. Unless you’re a child, in which case images are presumably okay. Miss Peregrine’s Home for Peculiar Children, you’re on notice. The first time I saw film bleeding into a horror novel in a way that detracted significantly from the text was Joe Hill’s Heart-Shaped Box. It’s one thing to shudder at a flickering ghost moving toward you in jump cuts when you’re watching a Japanese horror film, where the trope began. It’s quite another to read it. It’s a film technique, not a literary one, and bringing the one to the other is frequently ineffective. I’m reminded also of Zombie Island by David Wellington which contains description of shining a flashlight over a room and jerking back to catch something that moved just out of sight. These are visual tropes, not literary ones, and in both these cases I’d say the trespass of known film scares into text results in an awkward un-scare. Also huge these days are book trailers. 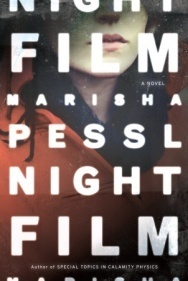 When major releases are presaged by YouTube videos, can Night Film truly be blamed for offering relevant film scraps throughout the book? I come not to praise or bury Night Film. I haven’t read it. But whether this is a sign of the publishing apocalypse, a vibrant strike for books as experiences beyond the page, or merely a marketing trick, I’m ready to welcome successful multimedia novels. San Francisco-based illustrator Sam Garland will be the next featured artist in Mission: Comics and Art‘s gallery. The shop will be showing off original pages and illustrations from Father Robot and his solo project Fall Forward. Father Robot is a new graphic novel written by Kristopher White and illustrated by Garland. The story follows the first self-aware mech who’s convinced he’s the father of a young girl he’s been sent to rescue. Garland will be signing copies of the graphic novel at an opening reception on September 7 at 7 p.m.
Mon, Tue, Thu-Sat: 12 p.m.-8 p.m.
Dame Darcy will be returning to the Bay Area this month for two events showcasing her new book Handbook for Hot Witches and her long running Fantagraphic’s title Meat Cake. Her first stop will be in the West Bay at vintage clothing shop and art gallery, Vacation. Her illustrations will be featured in Vacation’s gallery space for the entire month with a kick-off reception on September 6 at 7 p.m. The reception will feature music from DD and the Bronze and she’ll additionally be drawing illustrations in all purchased books. On September 15 she’ll be in the East Bay for a 5 p.m. signing at Escapist Comics on Telegraph. 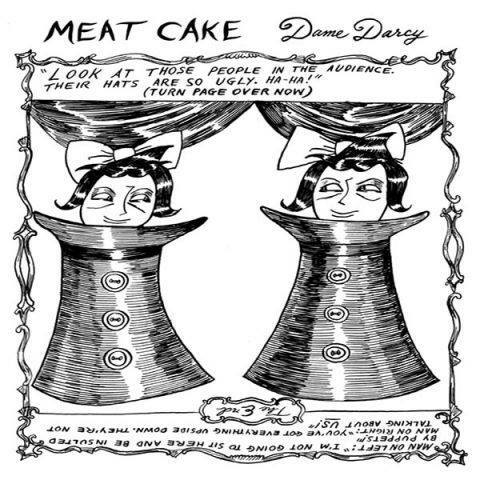 In addition to Meat Space, Dame Darcy has published a number of graphic novels including Frightful Fairytales, The Illustrated Jane Eyre, Dollerium, and Gasoline. Many of those titles will be available at Escapist. Mon-Sat: 10:30 a.m.-7 p.m., Sun 16-6 p.m. Wed – Sun: 12 p.m. – 8 p.m.
Lit Reactor has a great précis of yet another thieving publisher. Image of alleged stolen Ghost Rider art. Check out examples of Trestle’s artistic theft here.